The 8A is a fully adjustable crop lifter (also known as pick up guard) used on all windrowers and combines with fixed, floating, or flexible cutterbars that tilt downward. The 8A crop lifter is constructed of high strength ductile iron for durability and long service life. Plated grade 8 fasteners are used for high strength and corrosion resistance. Note: The 8A crop lifter is used for 3" cut systems only. For 1½" cut systems, see the 4S crop lifter. For a more economical alternative, choose the 1A crop lifter. The height adjustment of the crop lifter tip is provided by the six-way adjustment block. Sickle guards with a variety of geometries can be accommodated by the various holes in the adjustment block. 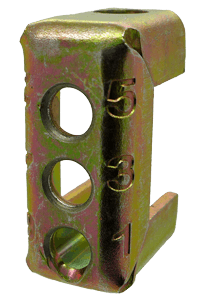 The adjustment block is constructed of die formed steel and is yellow zinc plated for corrosion resistance. This fully adjustable crop lifter is used extensively to harvest cereal crops (such as wheat, barley, oats, rye, and milo) ​on combines having sickle guards that tilt downward such as Allis Chalmers, Ford Class 622, Case III, Massey Ferguson, and New Idea flexible cutterbar. See 8A application Guide for details. Sickle guard and cutterbar geometries can limit the available crop lifter spacing options. The following are starting recommendations that can be altered as the application requires. Space Crop Lifters 6" to 9" on each side of row. Closer spacing will reduce loss by raising crops uniformly. Still not sure? Check out our proprietary crop lifter selector website for a guided, conditions based recommendation.